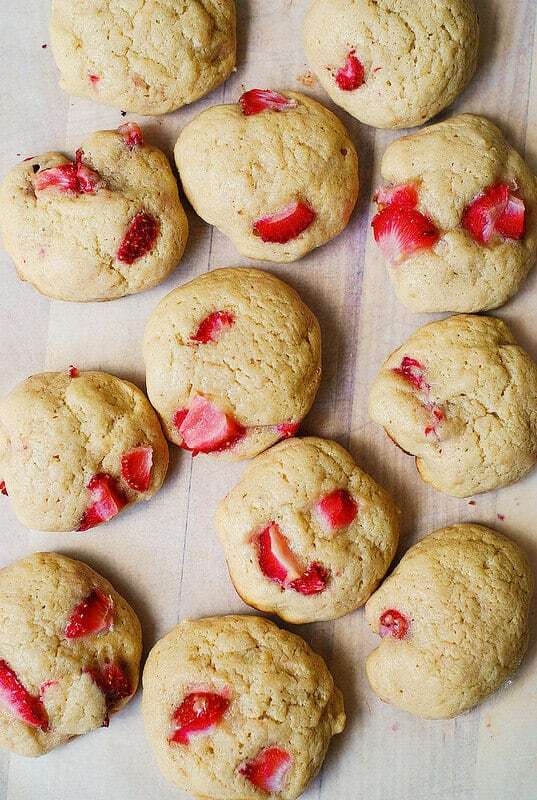 Strawberries and cream cheese combined in a cookie. Need I say more? 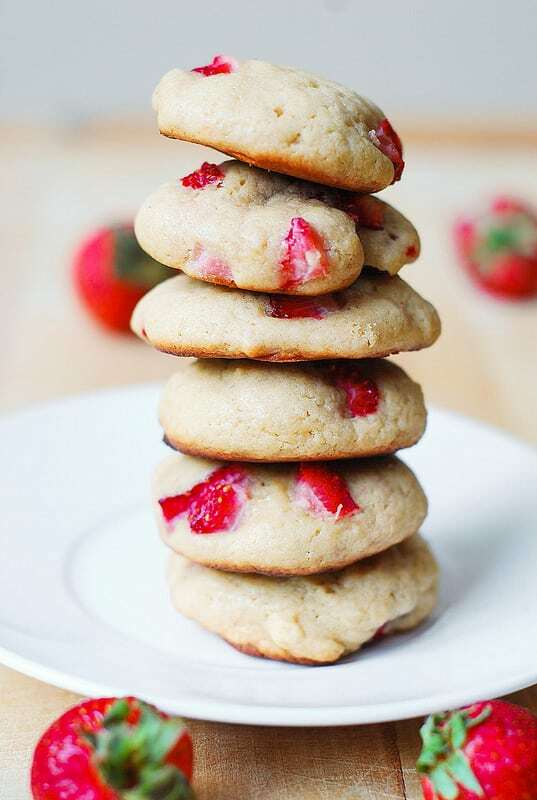 These soft, creamy cookies are fantastic for strawberry lovers! Great Summer recipe. 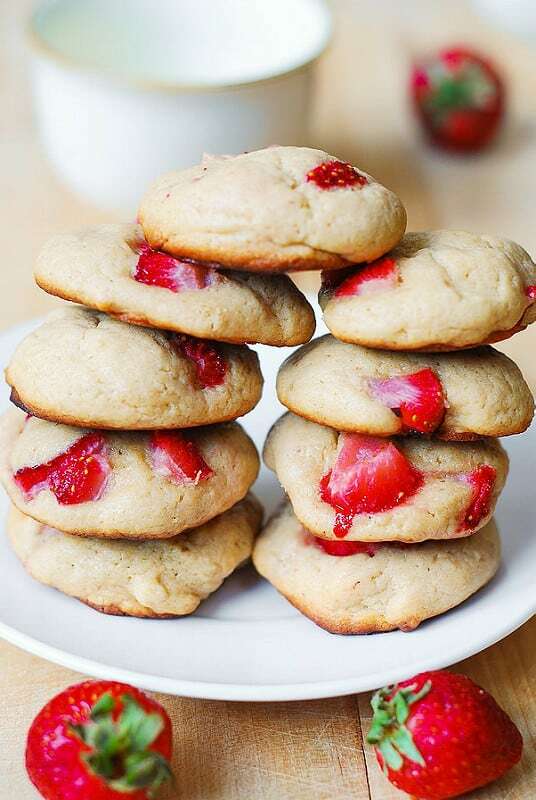 These strawberry cream cheese cookies taste like a strawberry cake but in a cookie form! Thanks to the cream cheese and the strawberries, the texture is very soft! The cream cheese and the butter should be of room temperature, NOT MELTED. This will help keep preserve the shape of the cookies. If the cream cheese and butter are melted, the cookies will spread out too much on a baking sheet. Finely chopped strawberries. 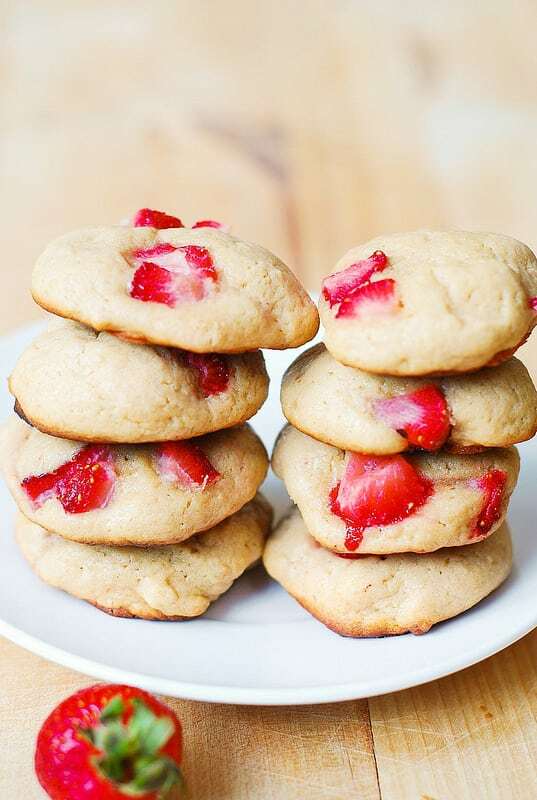 Strawberries should be chopped in very small bites so that they can fit into cookies. Once you made the cookie dough, you have 2 options how to bake these cream cheese cookies. 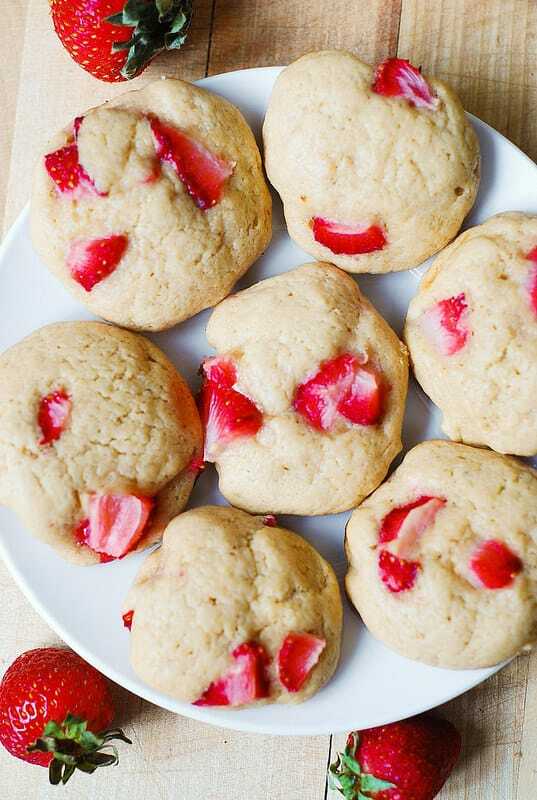 Because there is a cream cheese and strawberries in a cookie dough, you have to be careful not to lose the texture of the cookie during the baking process. I’ve baked these strawberry cream cheese cookies using 2 methods, both of which work great, with the difference being the actual shape of the final cookies. Method # 1 results in a nicer-looking, round-shaped cookie with a rounded top. Method # 2 is just basic drop and bake cookie resulting in a more rough looking cookie. Use one of the 2 methods below to bake the cookies. Method 1. Using the freezer. After the cookie dough has hardened (but not frozen) just enough so that the cookie dough doesn’t stick to your hands and is easy to handle, using the palms of your hands, roll cookie dough into cookie balls and drop them on the baking sheet about 1 inch apart. Bake for about 14 minutes until cookies brown a little around the edges. This way, your cream cheese cookies will come out in an almost perfect round shape, with nice rounded tops. Almost all the photos here are of these kind of nicely shaped cookies. Method 2. Without using the freezer. Using a teaspoon, just drop cookie dough by teaspoonfuls on the baking sheet, leaving about 1.5 inches between cookies. Bake for about 14 minutes until cookies brown a little around the edges. Same as in method 1, cool the cookies by removing the parchment paper or aluminum foil (with cookies on it) from the baking sheet onto a wire rack. The cream cheese cookies come out delicious but unevenly shaped, with somewhat uneven edges. Because the strawberry cream cheese cookies are soft, they are best kept refrigerated in an airtight container. Not only will this preserve them longer, it will also keep these soft cookies intact and keep the strawberries taste fresh! My husband says these are some of the most delicious cream cheese cookies I’ve ever made, and he has already eaten quite a few of them! Strawberry Chocolate Chip Cake made in a springform pan. Strawberry Banana Bread Muffins taste just like banana bread. Strawberry Almond Blondies are delicious sweet bars perfect both for breakfast and dessert. 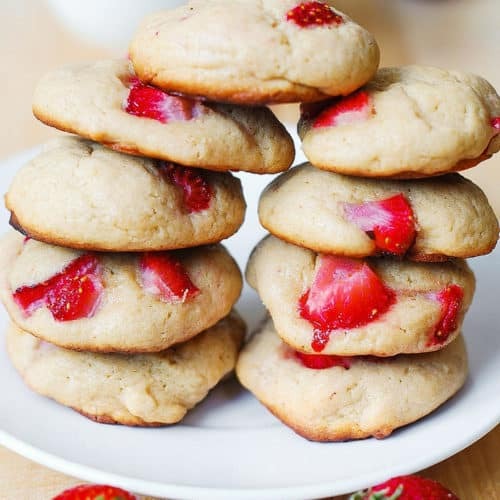 Same as in method 1, cool the strawberry cream cheese cookies by removing the parchment paper or aluminum foil (with cookies on it) from the baking sheet onto a wire rack. Cookies are best stored refrigerated in an airtight container. Can we make it without egg? I prefer Method 2. They are yummy and go great with coffee! These are very moist cookies to begin with. Maybe, it’s better to keep them just loosely covered instead of in an airtight container and consume them pretty fast. Your cookies are amazing! But just wondering, how many calories are in one cookie, or an estimate of how many, if you don’t know for sure. Thank you so much, and I enjoy your recipes a lot! These were yummy! Thank you! Easy to make too! How much butter, it says 4oz and then in parentheses 1 stick. 1 stick is 8oz. A stick of butter equals to 4oz, but in America, it equals to 8 teaspoons. Maybe you got those two measurements mixed up? Haha, I’m not sure. But yeah one stick equals to four ounces.